DD Tanks were designed to make their own way to the landing beaches after disembarking from their Landing Craft a mile or two offshore. Each was fitted with twin Duplex Drive screws (hence DD) and an inflatable floatation screen. Whether they swam, sailed or motored this remarkable amphibious craft and their brave crews, were early arrivals on the Normandy beaches. Except for the background notes and concluding remarks these are the personal recollections of Patrick Hennessey who commanded a DD Tank on D-Day. One of the lessons learned from the disastrous Dieppe Raid was the need for armoured mechanised vehicles to prepare the way on the landing beaches for the main invading force. This was achieved by clearing the landing beaches of obstacles and mines, preparing temporary roadways over barbed wire obstacles and ground otherwise unable to support the weight of tanks and heavily laden lorries and by destroying enemy defensive and sniper positions. Ingenious adaptations to Mark 4 Sherman tanks were created under the stewardship of Major-General Sir Percy Cleghorn Stanley Hobart KBE CB DSO MC (14/06/85–19/02/57). Collectively these became known as Hobart's Funnies. There were detractors and sceptics over some of his creations but on the landing beaches of Normandy in June of 1944 there was many a soldier eternally grateful for their survival to Hobart and his team of engineers and designers . 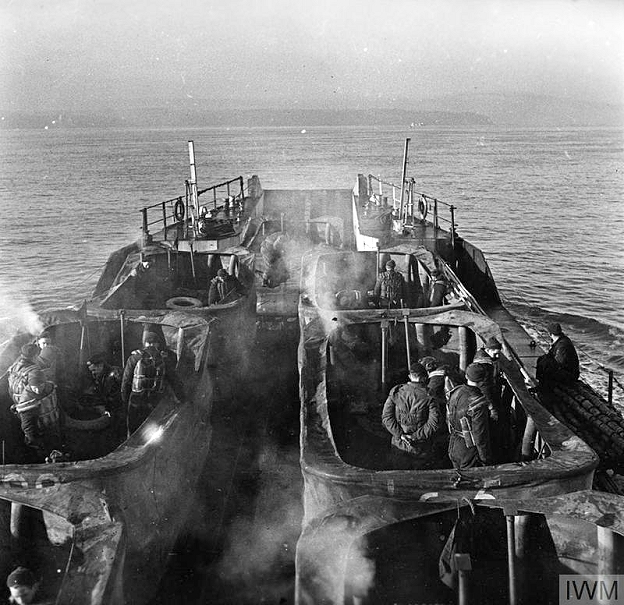 On the morning of the 1st of June 1944 we took our tanks down to the hards (hard loading/unloading areas, for landing craft, usually made of concrete). All of our kit was stowed and ammunition packed away on racks in the turret. We were ready to go. We had been through this procedure many times before but this time it was for real. For the most part there was a feeling of excited anticipation as we waited for the arrival of the Landing Craft Tank (LCTs) that would carry us across the English Channel. A few, mostly older men, were apprehensive. Individually, I think the majority of us wondered how we would face up to our first experience of battle. It was not so much a fear of going into action; after all we had joined up for that very purpose and we were fully confident in our weapons and training, but we wondered how we would cope under fire from a determined enemy. I asked the Squadron Sergeant Major, who had seen action in France in 1940, "what is it like in battle, Sir?" He answered: "Bloody noisy, mate!" The shore line was crowded with men and vehicles and Staff officers directed operations. 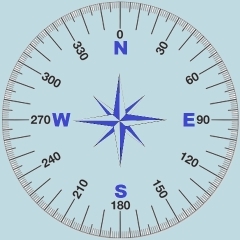 A General, his entourage and a host of red-capped Military Policemen controlled the many lines of traffic which seemed to converge on the area from all points of the compass. After about an hour amidst all the hustle and bustle, the LCTs approached from the sea. They came in to the hards, lowered their ramps and one by one we reversed our Sherman tanks onto the tank decks. Unlike modern Roll on Roll off ferries the LCTs only had a single bow ramp so we embarked on the basis of first on, last off. We were to be the second tank to launch from our LCT so we parked near the bows. When all tanks, men and equipment were on board the ramp was raised and slowly our LCT moved astern away from the crowds of onlookers. As we pulled out other ships came in to take on their loads. We headed out into the middle of the Solent and dropped anchor. Other LCTs came into position on both sides of us and more widely the sea was filling up with ships of every description. We watched all the activity in wonder and amazement. The sea became more choppy but we enjoyed the motion of the ship which seemed to add to the excitement. There was no accommodation for many of us and very few of us succeeded in rigging our hammocks properly so the majority bedded down on the hard iron deck. It took 4 days for the armada to assemble. The sea became more lively and despite taking anti-sea sick pills, many of us succumbed. The LCT was a flat bottomed craft so each time it reared up on a wave it crashed down again with a shudder and shake. Twice a day we were visited by the NAAFI launch which was a welcome distraction but chocolate and sticky buns were not on the menu for those of us in a permanent state of seasickness! Between periods of organised physical training we cleaned our guns again and again, ran the tank engines twice a day creating each time a blue cloud or diesel fumes which did nothing to alleviate our nausea. We took turns to act as aircraft spotters on the bridge but knew if the Luftwaffe had found us we would have made a wonderful target. Despite all this activity after a few days we were all feeling the strain of our confinement on our restless ship. On June 4th we learned that we were to sail that night and that the assault was to take place the next morning. A mixture of excitement and tension pervaded our craft but by then we were past caring where our landing beach was so long as it was firm dry land! Shortly afterwards a 24 hour delay was announced which was a considerable anti-climax. On June 5th we were assembled for our final briefing. 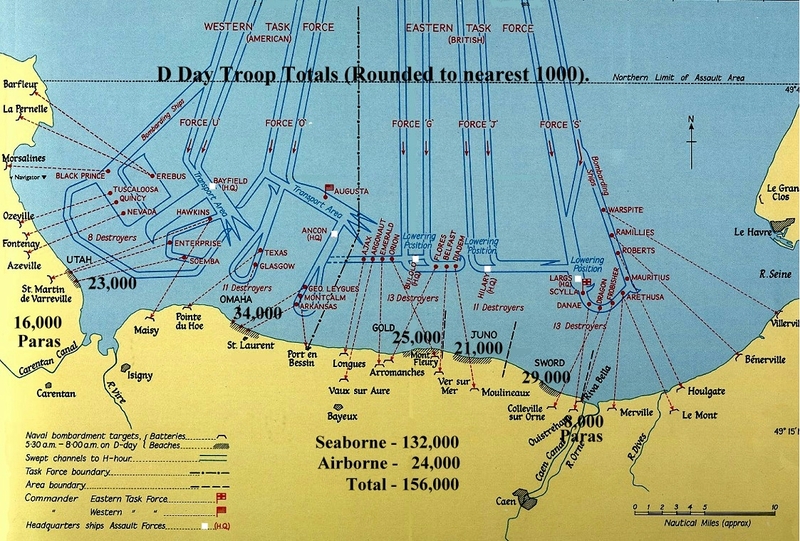 We were issued with maps of the Normandy coast in the area of the small resort of Lion-sur-Mer. We were to form the left flank of the assault with the Americans far over to our right. We also received a copy of an Order of the Day signed by General Eisenhower. At 19 years of age I was caught up in the universal feeling of excitement and pride. It crossed my mind that 'Gentlemen in England, now a-bed, must feel themselves accursed they were not here'. I certainly would not have wished to be anywhere else. That night we slipped anchor and felt the increased throb of the ship's engines as we headed out to sea. At last we were on our way. There was a mixture of feelings amongst the troops on board. For those of my generation, who were young and keen for excitement, it was all a great adventure. We had no responsibilities and our morale was high. Others with wives and children at home had been taken from their civilian careers. They had a more mature appreciation of what was involved. Looking back, it must have been much hard for them, but we youngsters did not give it much thought at the time. We were roused long before dawn on the morning of 6th June. The sea was still rough and a strong wind was blowing. We heard the drone of our airborne forces and watched them pass over us. There were hosts of gliders following their tugs, preceded by aircraft carrying the parachutists with busy fighter escorts above them. As daylight slowly appeared, we could see ships of every description stretching away to the horizon on both sides of us and to the rear. It was a stupendous sight which must remain in the memory of all who witnessed it. We marvelled that such a gigantic force could assemble over a period of five days and move across the English Channel undetected. When the order came to board the tanks we stowed away bedding rolls and put everything else securely in its place. We took up our positions to inflate the screen which would allow our tank to float and under its own power to land on our designated beach. The air bottle was turned on and the screen began to rise. We could feel the large waves battering against the LCT and we were under no illusions as to what they would do to a puny tank if the screen failed or was overwhelmed. Understandably we took particular care to ensure that the struts holding the screen in position were secure. The bombardment started with a tremendous roar of gunfire from the outlying battleships and cruisers. On our left we heard a terrifying 'whooshing' noise and saw a veritable fire-work display as the rocket firing ship (LCR) unleashed its salvos. The burning projectiles carved an arc through the sky as they sped towards the shore. Beyond her stood HMS Warspite, adding a loud contribution from her large guns. We had been warned that it would be very noisy but it still took us by surprise. We heard the order over the ship's tannoy, "Down; door, No 1" and we knew this was our cue. The ramp on the bow of our LCT was lowered into the sea and the ship hove to at a distance of 5000 yards from our landing beach. We started our tank engines and Sgt Rattle's tank moved forward down the ramp and nosed into the waves. We followed and as we righted in the water I could just see the shore line. It seemed a very long distance from our DD tank in that choppy sea! Slowly, we began to make headway. The crew were all on deck apart from Harry Bone who was crouched in the driving compartment intent on keeping the engine running. We all knew that if it stopped we stood no chance of survival. The noise seemed to increase and the sea appeared even rougher from our low vantage point and with only a flimsy canvas screen between us and the waves. We shipped a certain amount of water over the top of the screen from time to time but trooper Joe Gallagher, the co-driver, manfully operated the bilge pump and kept us safe. To each side of us other DD tanks were launching. 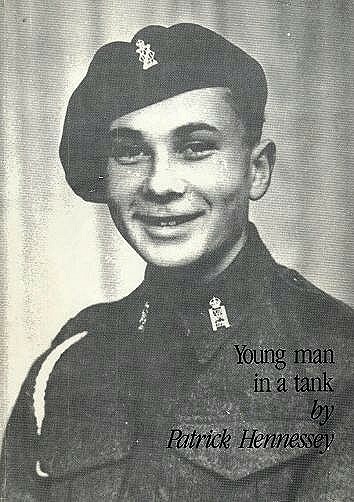 To my right and behind me I saw Captain Noel Denny’s tank as it came down the ramp and into the sea. It straightened up and began to make way, but behind it I could see the large bulk of its LCT creeping forward. The distance between them closed and in a very few minutes the inevitable happened. 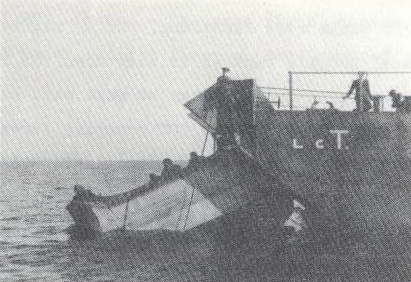 The bows of the LCT struck the DD tank and forced it under the water. The tank disappeared beneath the LCT and was never seen again. Captain Denny escaped and was picked up but the tank was sunk and the rest of the crew was lost. There was nothing anybody could do. These were our first casualties. We battled on towards the shore through the rough sea. We were buffeted unmercifully, plunging into the troughs of the waves and somehow wallowing up again to the crests. The wind was behind us and this helped a little. The noise of battle continued and shells and rockets were passing over our heads towards the German defensive positions but we were also aware that we were under fire from the shore. The Germans had woken up to the fact that they were under attack and had brought their own guns into action. It was a struggle to keep the tank on course but gradually the shoreline became more distinct and we could see the line of houses which were our targets. Seasickness was by now forgotten. It took over an hour of hard work to reach the beach and it was a miracle that most of us did. As we approached, we felt the tracks meet the shelving sand of the shore, and slowly we began to rise out of the water. We took up our posts to deflate the screen, one man standing by each strut. When the base of the screen was clear of the water the struts were broken, the air released and the screen collapsed. We leapt into the tank and were ready for action. "75, HE, Action - traverse right, steady, on. 300 - white fronted house- first floor window, centre". "On" "Fire!" Within a minute of dropping our screen we had fired our first shot in anger. There was a puff of smoke and brick dust from the house we had aimed at, and we continued to engage our targets. Other DD tanks were coming in on both sides of us and by now we were under enemy fire from several positions which we identified and to which we replied with 75mm and Browning machine gun fire. The beach, which had been practically deserted when we had arrived, was beginning to fill up fast. The infantry were wading through the surf and were advancing against a hail of small arms fire and mortar bombs. We gave covering fire wherever we could and all the while the build up of men and vehicles continued. Harry Bone’s voice came over the intercom, "Let’s move up the beach a bit - I’m getting bloody wet down here!" We had landed on a fast incoming tide, so the longer we stood still the deeper the water became. As we had dropped our screen, the sea was beginning to come in over the top of the driver’s hatch and by now he was sitting in a pool of water. The problem was that the promised mine clearance had not yet taken place, so we had to decide whether to press on through a known mine field, or wait until a path had been cleared and marked. Suddenly, the problem was solved for us. One particularly large wave broke over the stern of the tank and swamped the engine, which spluttered to a halt. Now, with power gone, we could not move, even if we wanted to. Harry Bone and Joe Gallagher emerged from the driving compartment, soaking wet and swearing. More infantry were coming ashore, their small landing craft driving past us and up to the edge of the beach. There was quite a heavy fire fight in progress so we kept our guns going for as long as possible, but the water in the tank was getting deeper and we were becoming flooded. At last we had to give up. We took out the Browning machine guns and several cases of .3 inch belted ammunition, inflated the rubber dinghy and, using the map boards as paddles and began to make our way to the beach. We had not gone far when a burst of machine gun fire hit us. Gallagher received a bullet in the ankle, the dinghy collapsed and turned over and we were all tumbled into the sea, losing our guns and ammunition. The water was quite deep and the sea was flecked with the traces of bullets all around us. We caught hold of Gallagher who was swearing like a trooper and we set out to swim and splash our way to the beach. About half way there I grabbed hold of an iron stake, which was jutting out of the water, to stop for a minute to take a breather. Glancing up I saw the menacing flat shape of a Teller mine attached to it; I rapidly swam on and urged the others to do so too! Somehow, we managed to drag Gallagher and ourselves ashore. We got clear of the water and collapsed onto the sand, soaking wet, cold and shivering. A DD tank drove up and stopped beside us with Sergeant Hepper grinning at us out of the turret. "Can’t stop!" he said, and threw us a tin can of self heating soup from the emergency rations each tank carried. We pulled the ring on top of the tin and as though by magic it started to heat itself up. We were very grateful for this and, as we lay there on the sand in the middle of the battle taking turns to swig down the hot soup, we were approached by an irate Captain of Royal Engineers, who bellowed; "Get up, Corporal – that is no way to win the Second Front!" He was absolutely right, of course. Rather shamefacedly we got up, moved further up the beach and found some medical orderlies into whose care we delivered Joe Gallagher, who cheered up considerably when someone told him he would be returning to Blighty as a wounded "D Day Hero". We left him at the Field Dressing Station and moved on. We had only our pistols with us but found a discarded Sten gun and some magazines. Attaching ourselves to a section of the South Lancashires, we made our way inland. The beach, by now, was a very unhealthy place to be. It was under intensive small arms and mortar fire, mines were exploding and being detonated by our own mine clearing services and all the time the build up of troops and vehicles continued, making it a very crowded area. Clearly, we were not much use to the infantry in our unarmed state, so I found the Royal Navy Beach Master and reported our presence to him. He was a very busy man at the time and advised me to: "Get off my bloody beach!" We made our way to the road which ran parallel to the sea, some five hundred yards inland, and there we met up with some other un-horsed tank crews. I could not help feeling a bit unwanted at that stage. There was plenty of action taking place but there was not a lot that we could do to influence the course of the battle and nobody seemed keen to invite us to join in. Of course, we had already played our part, and we could look back with some satisfaction. We had done what most people had thought impossible, we had swum a 32 ton tank through 5000 yards of savagely rough sea and had given that vital support to the infantry to enable them to do their job of clearing the beach. On reflection, I had learned a valuable lesson from the events of that morning. Sgt. Hepper, for instance, had clearly not been deterred by the prospect of mines on the beach and had driven his tank ashore, accepting the risk. If I had used initiative and done the same, our tank would not now be standing submerged some 150 yards out in the sea. The RE Captain too, had the right idea of ‘press on, regardless’. In the heat of battle it really does not pay to sit back and weigh up the pros and cons of a situation, it is quick decision and immediate action which brings results. I mentioned these thoughts to Harry Bone, whose only comment was: "Bugger that! – if we had hit a mine, I would have been sitting right on top of it". The beach was still a scene of frantic activity. Landing craft were coming in, depositing their loads of men and vehicles, then backing out to sea again. The area was swept by machine gun and mortar fire and snipers were busy from the windows of the houses. Shells and mortars were kicking up clouds of sand, the noise level remained very high, and the infantry were taking a lot of casualties. I saw death for the first time that day and also for the first time I came face to face with the German Army. About two dozen prisoners were being marched to the beach, hands held aloft, some were wounded, all looked shocked and frightened. They were a scruffy crowd, not at all the ‘Supermen’ we had been led to believe were opposing us. Most professed to be White Russians or Poles, but there were a few who were arrogantly German. Eventually, we were found by Major Wormald, who directed us to make our way to the village of Hermanville. We were delighted to see him and to know that he had survived the landings. As he drove off in his tank, we felt a return of confidence as we started the three mile trek to Hermanville. At Hermanville we settled into a barn and some farm buildings, and eventually what was left of ‘A’ Squadron came together. We had not suffered a great number of casualties in terms of men lost, but we only had 5 serviceable tanks remaining from the 21 which had launched that morning. Each of the surviving crews had their own dramatic stories to tell of that unforgettable day. 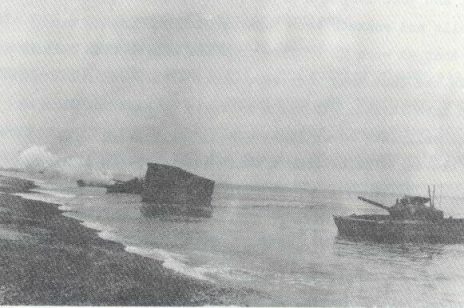 We learned that our sister Regiments, the 4/7 Royal Dragoon Guards and the Staffordshire Yeomanry, had decided that the sea was too rough for DD tanks to operate and had come in dry-shod. Our Regiment was the only one to attempt the sea-borne assault on Sword beach. ‘A’ and’ B’ Squadrons had motored in over 5000 yards of troubled water in a force 8 gale! This was a far greater distance than ever thought possible especially in such high winds and with sea conditions far too severe for DD tanks. Thus, we had written another page in the honourable history of our Regiment and Major Wormald had earned a well deserved DSO for his part in the Landings. We spent a number of days in Hermanville where we dried out and received new bedding and equipment from a stores vehicles that had caught up with us. These were largely uneventful days as the battle moved inland but we had one exciting episode when we removed a couple of snipers from the nearby church tower. I acquired a parachutist’s bicycle and on the morning of 7th June I returned to the beach to see what could be salvaged from our tank. A secure beachhead had been established and there was no firing. It was still very busy with the arrival of stores and backup troops to support our advancing forces. The tide was out and I could see our tank standing forlornly in about 3 feet of water. All items of value and our personal possessions had been taken. Harry Bone was already there having somehow got hold of a motorbike. He roundly cursed the infantry whom he accused of stripping our tank, but his mood improved dramatically when he found two jars of rum which he salvaged and conveyed back to Hermanville. Pat gives no summarising remarks about his war experiences at the end of his book. He fought his tank through the rest of the campaign in France, Belgium, Holland and the first battles in Germany, getting promoted to Sergeant on the way, but in April was selected for officer training. After commissioning out of Sandhurst in 1946, he continued to serve in the Army until 1951, when he transferred to the RAF. He retired as a Group Captain in 1984 after which he penned these wartime experiences. Sea Operating: Diagram of water displacement to illustrate how a solid object can float - the principle of the Sherman tank. Model used to illustrate flotation gear. Loading the tank onto a ship. Checking propellers, hydraulic steering gear, waterproofing, engine, flotation gear. Crew put on Amphibious tank escape apparatus and the tank officer inflates it with oxygen. Periscope placed in position, ramp lowered. Senior Naval Officer runs launching. © IWM. This web page about DD Tanks on D-Day was written by WW2 Tank Commander Patrick Hennessey. It was abridged for website presentation and approved by his family before publication. 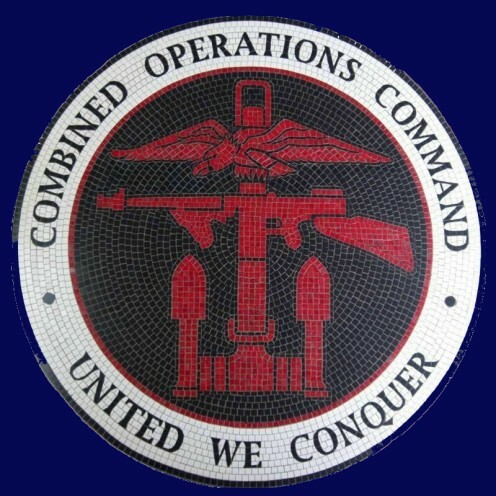 We thank Patrick Hennessey's widow and son for permission to publish the article on the Combined Operations website.